Take out the bolt and turn it over, you'll see a rubber piece in the hole right below the nozzle. Take it out and replace it with the corresponding piece from the g&g rubber set (the middle one in the next picture). The other pieces are for the standard tanaka hop up, which you won't need. Hey thanks for the help but is that little rubber piece worth the $16 it costs and will I be able to have a somewhat consistent gun without an hpa rig? Also I wanted to know if the steel cocking piece, knock arm and plunger set, and the steel valve knocker were worth getting? I know they help durability which is good but do they help anything else? If I have the striker spring do I need those parts just for durability? I don't know about all those pieces you just mentioned. What sux about the rubber piece is that the other 2 are useless so your really paying $16+ ship for just the one little rubber piece. I think it will still be a decent rifle w/o the HPA rig. All ive done to mine is the teflon tape, cleaned the barrel, tightend up & loctite'ed the whole front end (my gun was bought used..and the front end was very wobbly) and did the loctite on the bolt screw thing. My gun is getting pretty acceptable performance right now with little work. I ordered the KA hopup rubber and the polar ice nub also, and am switching to propane... I think w/ those 3 changes, it will be about 70% efficient with shots. Hey thanks but I still need to know more about the other upgrades. Also, for your gun, you should consider getting a tight bore. I have a madbull 650mm 6.03 barrel and that was only $30. If you do get this you will need to replace the orange tip with a threaded one but you wont actually need a silencer to hide the inner barrell. The new barrel would only be slightly longer than the original one. Also, make sure you're using propane before you put that new bucking in. Green gas has a lot of silicone which is bad for the bucking. Still make sure you run a little green gas through your mag every now and then for maintenence purposes. I don't have the rubber set myself, so I'm not sure just how much of a difference you will see. Most people say it's worth it though, even if you're basically paying for just one of the three pieces. I couldn't get the steel cocking piece to fit, even after modifying it slightly (on a tanaka m700 aics for the record), so I've given up on that but as far as I know it would only help with durability. The knock arm & plunger set however, provides for a more consistant fps output as well as adding durability and should be well worth it. The steel valve knocker is for durability only. he knock arm & plunger set however, provides for a more consistant fps output as well as adding durability and should be well worth it. Link?? The problem im having is, I cant go too wild on modding this thing b/c out of the box it hits the max limit of my local field. So as long as it doesn't add to the FPS, I can do it. Remember that you can always tweak the FPS settings down by loosening the bolt that the striker spring is on. 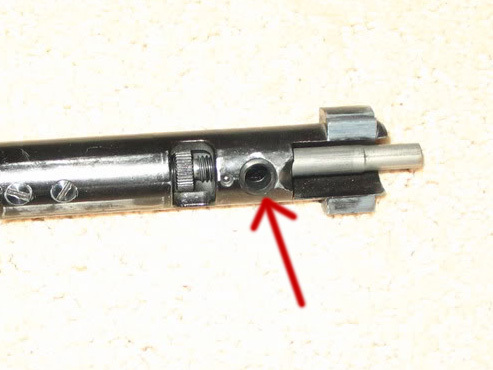 You can access this by removing the bolt, then removing the two flathead screws in the middle of the bolt (this is actually how you would go about installing the G&G striker spring, by the way). Just make sure you loosen the grub screw at the back of the bolt. You're going to have to tweak it to get the FPS right, but once you do, you shouldn't have to mess with it again. That's another reason why I love my CO2 rig. Complete adjustability of FPS. With Propane, mine shoots 630 FPS, so I need to tone it down to the field limit of 550 FPS. Also, you really do need to replace the barrel and bucking combo. The stock barrel is terrible (worst I've ever seen, as a matter of fact), and so is the bucking. How much did your Co2 rig cost? Anything else I should know about the Co2 rig? Also, can a gun without the durability parts handel the striker spring? I already ordered the spring but I'm getting the other parts a little bit later. What are everybody's experiences with the KA bucking? My rig cost about $120 the first time around, but I'm not sure how much it's going to cost when I rebuild it (I'm redesigning it for compactness so that I can mount it to the side of my stock - since I'm reusing the same regulator, costs shouldn't be too terribly high; the original design had the CO2 tank mounted to my thigh by way of a Milspex P90 drop leg mag pouch). There's ample information on building your own rig in Brainplay's guide, so I'm going to leave the rest to you. I don't have any of the "durability" upgrades in my gun (there's much better things to spend my money on, like my new pistol project, or my Steyr Scout project, or any number of other things). When my gun starts malfunctioning because I need one of those parts, I'll buy just the one that'll get me back on the field ASAP. I do, however, have the striker spring, and love it. It not only ups the FPS, but also increases consistency. You could follow my own philosophy and only replace something when it needs it (either when it breaks or if it comes crappy out of the box [such as the barrel and bucking combo]). My CO2 rig cost me about $90, it measures 5-3/8" x 2 1/4" x 1". it uses a palmers LPR + fittings and quick 12g changer. 0-300psi. I love it!! On the striker spring, the other parts will wear a little bit quicker. The worst one would be the bolt handle. Try to keep it greased all times. I use the KA bucking and the only problem with it is that it looses consistency after 500fps with .40g, in my experience. My original rig cost around $70 because I had the 12gr quick change and remote line on hand but I splurged on regulator. The latest cost around $120 because I spent extra on McMaster Carr fittings for several mags. I'm tempted to try Rdjorge's version using the LPR. I've seen ANS jackhammer II's go for around $20 which is the same as the Palmers LPR version. Whats the cheapest I can go and still have something decent. I'm a litlle low on the cash. I only have one mag so that should save me a little bit. What are the parts I would need for the rig? 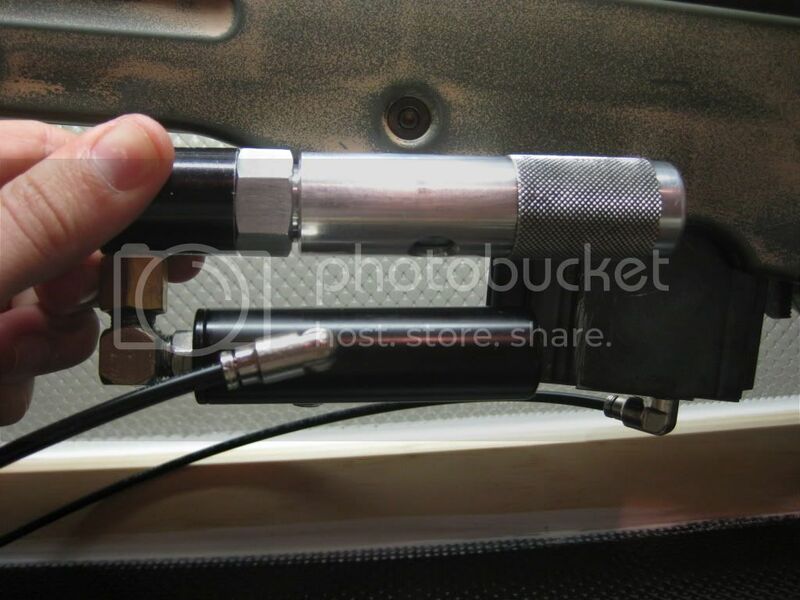 By the way, is there any way that this gun will be good without the hpa rig, it might just be too expensive for me. Hey sorry for all these posts but I need some opinions. I'm selling my two aegs. I have a jg and an echo 1 so I think I can get just under $200. This will really boost my airsoft funds but I need to know if putting this money into my m700 is worth it or if getting a new gun is better. I found the echo 1 asr which is basicly a slightly upgraded utg l96. It's modeled after the well mb06 which has the same general internals as the well l96. The well l96 is the same as the utg. I can get this up to about 530 fps and get a tightbore for the money I will get from my aegs. It sounds like a good deal to get get a sniper with more than 500fps and a tightbore for less than $200. I know that this would also be enough for the hpa rig and all the other upgrades I still need for my m700. I could even get an aeg but I still like sniping a little more. What do you think my best option is. You've already got a Madbull 6.03 which is the tightbore. You can make an air rig which will give you the power and consistency that you're seeking. Buckings are cheap. At this point you're already at or past the point of the Echo rifle. However, if you're on a budget then you'll need to stick to a long coiled remote hose and a large Co2 tank rather than 12gram capsules. You may run through 1 or 2 or them per game and that can be costly if you're on such a low budget in the first place where as a larger Co2 tank hanging on your hip will last for much much longer. If that isn't agreeable then you will probably move away from gas rifles and go back to springers where you won't have to worry about gas costs. How much would a rig with the 12g Co2 capsules cost? That would be the most convientent rig. Also you said that my m700 with my current upgrades is probably better than the the upgraded echo1 spring sniper so is there any point of going back to spring guns. Good spring guns usually seem to cost up to $500 with upgrades which is actually more expensive anyway. As I said before I will have nearly $200 for airsoft purposes. Could this be enough for everything I need (upgades and rig)? I already have a tightbore, as you mentioned, a striker spring, and a bucking. My CO2 rig cost me about $90, it measures 5-3/8" x 2 1/4" x 1". it uses a palmers LPR + fittings and quick 12g changer. 0-300psi. I get about 3-4 mags = 84-112 shots on a single 12g cartridge shooting around 500 fps with .40g madbulls. Thanks rdjorge that seems like something I can afford. Does this give you good performance and can you store one in a battery pouch on the stock? Also where can I get the parts you have? Yes the performance is great. You can read a lot of reviews about the palmers Rock LPR. I don't know what is the size of your battery pouch, but I listed the dimensions earlier. I bought everything online. I had the 12g quick changer and ASA from old paintball days... I factored in the prices of a new ASA from palmers and a 12g quick disconnect + all the other parts to be around $90. I used a duckbill ASA with the duckbill part cut off. You can choose to have a quick disconnect instead of the straight fitting if you plan on using 10 round mags. The one in the picture is a 28 round. PM me if you need any more help! Thanks a lot. This really helped. I will definately consider this. Now I'm down to deciding between this or one of the new airsoftgi g4 series guns. No problem! I like the g4's too but they are AEG's!! I can shoot my friends with high end AEG's from very far! Last game I got 2 kills at about 330ft (google earth comfirmed!) and they never saw me! Now that I look at this I may have some problems. Well, that biggest problem is that I have no clue on how to go about creating this rig. I don't have any experience on this kind of stuff and I'm not even sure if I have access to the right tools for the job. Basically, I may need a lot of help from you guys if I decide to take on this project or I'll need a pre-built rig which is probably too expensive for my budget anyway. Wait, I know this is kind of off topic but are you saying that a g4 has a range of up to 330ft or only some kind of crazy upgraded one? Also I know that they are aegs but it seems like no matter what sniper I try I end up with a broken gun or a project that will end up costing like $500 so I end up selling the gun. Well, we will try our best to help you. All you will need is some locktite and some wrenches! Manslayer, Co2 12gr's can cost between $0.50 to $0.75 a pop depending on where you go to buy them. Academy usually has a 15 pack for $10. Not much but if you're on a budget it adds up and people have complained about the cost here. Hey Rdjorge, when you get a chance can you chrono a few 10 rd strings using .20's or .25's. I've been wanting to see the consistency on those things. Alright, I definately have wrenches and I can get some locktite but will I need a drill (which I have) and isn't there some kind of tool for threading the mag? Now I'm down to a few choices. The only reason why I wouldn't fully upgrade the m700 is because I like convenience having a hose running to a tank from my gun just doesn't seem like a great convenience. Now I found a way to get a spring sniper shooting at 550fps with a tightbore for around $220 with a scope. I may also go for a g4. How much range do you think I could get with a sniper like that and the g4. Overall how would they compare to the m700 and do you think they would be good? Don't get me wrong. I'm still considering the m700. Does the rig seem inconvenient to you guys or is it ok. Will I need any other upgrades after the striker spring, bucking, and tightbore? I also got a polar star concave spacer just to see what I can do with that. By the way brainplay, I don't mind the cost of the Co2 12gs I can buy them in bulk at walmart or 's for a pretty decent price. How much could I sell a kjw m700 fully upgraded? I just want to know for future reference so that if I ever get bored of airsoft or just the gun I won't feel like I completely wasted my money. I will definately have this gun for a while if I follow through with my project. If you run a compact CO2 rig, then it's actually more convenient than if you were to leave it set for unregulated gas (you don't have to mess with the gas at all except to turn it on and set it), but that's your decision to make. A larger rig is a little less convenient, but still beats unregulated gas over the head with a 2x4. You'd need either a hand drill or drill press, the appropriate size drill bits, and the appropriate size thread tap, in addition to the actual fittings. Read Brainplay's guide to help out there. Right now, my rig is actually a lot less annoying than I thought it would be. I figured my hose would get caught on everything (my tank is on my web belt), seeing as that's what happens when I wear headphones, and other than a few minor incidents, I haven't had any problems with it. I'm rebuilding my rig to be more compact since I'm at a point where I'm trying to minimize my "footprint", so to speak (lighten my load, minimize the amount of gear covering me so that my camo can do its job as effectively as possible, and reduce noise when I move; plus, the area where I live is hot and humid), though, so I'm not sure how it'll be with the new gear on there. Spring rifles are nice, but the actually end up being more expensive than gas rifles. I've put about $600-700+ into my springer, and about $500 into my KJW. The thing that gets people with gas rifles is that you have to do pretty much everything up front, versus doing it piecemeal like you would with the springer. Are you sure I would need to spend $600-$700 on a springer because I could get the Echo 1 asr for $110. Airsoftgi has a cylinder set for $35. A tightbore is $30- $50 and it comes stock with metal sears. It will be 550fps. Also, it would probably be pretty accurate. Could this be good for a springer? 550 fps spring (neither I nor the guy I acquired it from know what the power of the spring, but we know that it'll put a rifle with a tightbore at 550 with a 0.20g BB (our field's limit)). I put these in over the course of 2 years, and you don't realize it but all those little things do add up, and you're usually astonished to find out that you've spent damned near $1000 on your rifle. I know people who have gone well above this amount (close to double) when they started adding in replacement parts and such. So you think that my springer plans are pretty terrible right? Not terrible; just incomplete. My parts list reflects the problems I've encountered (like the KM HEAD piston that I had that broke after three shots, or my discovery that the stock piston head wouldn't fit my PDI chamber, for example), and a few optional upgrades that I did because I had the means and wanted them (like the Maruzen parts, minus the cylinder head and the trigger mech). What it doesn't show is the countless hours I've spent building and tuning my rifle. We call airsoft sniper rifles money pits for a reason. You are going to need a PDI hop chamber eventually (those things are touted as amazing for a very good reason). That's an extra $60-70 depending on whether you get it from overseas. AEG barrel? $40-80 depending on the brand and quality. AEG bucking? $7-20 depending on brand. Also, I've had the WELL version of that gun (it's basically the WELL MB06), and it isn't compatible with either the Laylax Zero Trigger or whatever they named the PDI trigger. It's a clone of the Maruzen SR2, which was designed for simplicity to fill a niche in Japan (SR stands for "Simple Rifle", and the Maruzen comes without a hop up, even). Other than that and the actual cylinder itself (that's also proprietary; the part where the bolt goes on is shorter than the same part on the regular APS2), the gun's compatible with Maruzen APS2 parts, though. Pistons, cylinder heads, springs, springs guides, PDI hop chamber - they all fit. Also, metal sears aren't worth jack if they're made of crap metal. Both spring and gas rifles are among the most reliable out there (spring wit minimal upgrades, gas is usable out of the box, but it isn't consistent until you regulate the gas that's propelling the BB). While I prefer my KJW, my UTG is currently ol' reliable because of the problems I've been having with my KJW (the hop isn't working right, and the Tanaka long mag I have swelled because I cranked the pressure too high on my air rig).I highly urge you to go with a UTG L96 or WELL MB01 if you're going to go springer. I've been able to take 280-300' shots accurately with mine. Now that you say how much that will cost I'm looking away from spring rifles but it was really helpful what you said. What is the farthest range you get an accurate shot with your kjw and what will I need other than a tightbore, bucking, striker spring, hop up nub, and Co2 rig. Should I get the rubber set, gas route spring, knock arm and plunger? The furthest I have gotten with my personal rifle was about 250-275'. I haven't been able to tweak it to go further because I damaged my hop chamber and have to replace it, as well as my bucking. That sounds good; the knock arm and plunger are durability upgrades, so I'd hold off on them until your mags are so damaged that they don't work properly any more. To be honest, I'm not sure what effect a new gas route spring would have on the rifle, but I'd imagine it'd result in increased consistency. I'd also wait on the rubber set until it's necessary (and starting out, it's not). I'm also going to try some custom gas route connectors made by Ben over at Satoru (AKA Edgi and Polarstar). You might want to grab a couple, but wait until I find out for myself what kind of effect it'll have on consistency. Hey thanks, I'll be waiting for your results on those gas route connectors. With a good hop up do you think I would be able to achieve over 300ft of range. By the way, what happened to your hop chamber? One more thing. Is it needed to have more than one 10 round mag when playing? I'm just not sure if I can put out another $40-$80 on mags. To be honest, I'm not sure what effect a new gas route spring would have on the rifle, but I'd imagine it'd result in increased consistency. When you fire your rifle the gas route connector spring is what keeps the brass gas route connected to the bolt. A weak spring may be forced back by the pressure as the gas slams into the bolt. Any slight opening between the brass gas route on the mag and the rubber seal on the bolt can cause a slight loss in pressure thus affecting the consistency. If you have brand new springs then the chances of this happening are medium to low. As you wear in the rifle the wear on the spring can degrade it's performance. This is also one of the reasons why you should replace the thinner (albiet longer) stock striker spring with the much thicker G&G version. Very true. All stock springer rifles have metal sears but are often pot metal and break over a few months of hard use. Adding in a stronger spring drops that to 1 month. This is why people easily drop $100 on the Zero trigger or other sear sets. Does the rig seem inconvenient to you guys or is it ok.
My rig is substancially different from the guide at this time. The guide is a basic basic version that allows for the use of easy to find parts so as to show people how easy it is to make a rig. Right now the body architechture is still the same but the fittings are all McMaster Carr micro fittings. There is a black macro-line hose a little more than a foot long that runs from the mag to a cheek rest/pouch on the side of my rifle. A rifle sling is more likely to get tangled up that that thing. Where can I get a pouch that a Co2 rig can fit in? Large or small? I use a Milspex dual P90 mag pouch for my large one with a 9oz CO2 tank. The new smaller one will be fit into a Blackhawk stock-mounted magazine pouch, but a battery bag would work quite well too. Brainplay, that's what I suspected would happen, but without experiences or solid evidence of my own, I'm loathe to make suggestions on something like that. Since now I'm thinking seriously about this, I'll test a new spring in my mag when I change out the gas route connector, and since I'm buying some more KJW mags anyway, I'll try various combinations of connectors and springs. Here is a review of various (probably all) of the magazine upgrade parts, Link. Okay so I was playing a game with my friends today and I just realized that in my m700's current state it's not bad so now I'm really excited to start upgrading. My striker spring and bucking just got backordered which is really annoying but I still got .36gs and my polar star spacer coming. I just need to sell my m16 and aug so that I can pay for the Co2 rig. I also realized that this gun causes some physical damage. It left the biggest welt on my friends arm but it was kind of at close range. This is pretty random but do any of you know where I can sell some guns?